For every one cup of rice, use two cups of water. Add olive oil and salt to water. Once water is boiling, reduce to a simmer, and add rice. Cover pot and cook for twenty minutes. For brown rice, cook for thirty minutes. In a large pan heat coconut oil over medium-high heat. Once the oil is heated, add red onion and carrots. Sauté until onions are translucent, about 5-6 minutes. Add frozen veggies and cilantro to the pan. 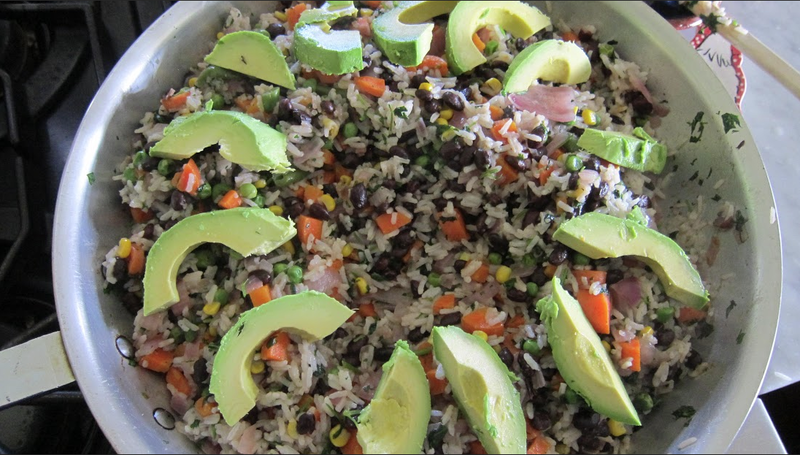 After about 2-3 minutes, add black beans, rice, salt, and lime juice. Mix all ingredients together, and add sliced avocado on top before serving. Enjoy! If you don't have one of the ingredients listed, don't worry! Stir fries are whatever you want them to be!